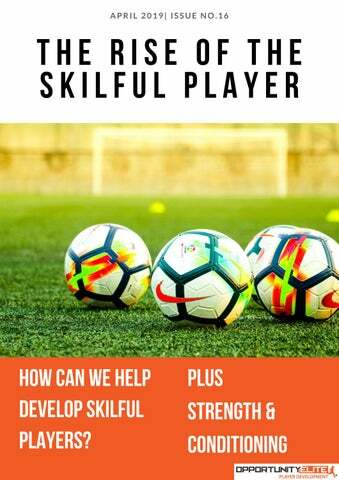 HOW CAN WE HELP DEVELOP SKILFUL PLAYERS? Welcome Welcome to the 16th edition of the OpportunityElite Player Development Magazine. We're here to help young players to develop their game. If you are a coach looking to learn new ideas and read new articles and opinions, or a player looking to improve, we have you covered. This month we look at the development of skilful players. At the moment, in England, there is a great buzz and enthusiasm around some of the young talent that is being developed. How can we, as players and coaches, help develop these confident players, fearless on the ball, with a bag full of tricks in their skill set? It's a given that all top players are technically gifted. We look at how we can help develop players to the next level above that: gifted and exciting on the ball. Can we keep continuing with the rise of the skilful player? In addition to that, we also have Strength & Conditioning from our Coach, George Lyons. Using his methods and our training drills and techniques will soon help players develop their game. Thanks for joining us and we hope you enjoy! Watching England in this month's qualification games for the European Championships next year has shown the tremendous strength in depth and number of young players coming through the ranks. Gareth Southgate was prepared to introduce Callum Hudson-Odoi and Declan Rice, in addition to fellow youngster Jadon Sancho. In the U21s there is also a large number of technically gifted players who I am sure will receive their chance in the senior squad soon. Watching these players has shown the elite level and exceptional talent that they possess. Callum Hudson-Odoi, before even making his full Premier League debut, shone on his debut and subsequent starting role against Montenegro. Jadon Sancho showed the skill and confidence to take players on, grabbing an assist for Raheem Sterling in the first half of the Czech Republic game. The technical level is superb, but these players also have a skilful nature about their game. They are full of tricks, with ability to attack their opponents with both feet. It seems to be that there is more room in today's game for the skilful player and the game is evolving greatly. As players and coaches, we can help develop players to become skilful, creating the right environment for these players to reach technically elite levels. What is a Skilful Player? In truth, there is no exact definition of a skilful player but, generally, we feel that we class skilful players as exciting, unpredictable and very talented. The way football is played has changed hugely over the last couple of decades. Manchester United's treble winning team played some fantastic football and were much more direct than current top teams. The ball is now on the floor for much longer periods of time and the technical level of players at all levels is increasing greatly. Referees officiate differently, tackling is becoming less physical and players are now encouraged to intercept more than slide in to the tackle. This is giving confident players protection, allowing them to develop the skilful side of their game, expressing their talents. So what can we say makes a skilful player? What techniques do they possess that can allow them to be classed as skilful? We must give players the chance to practise new techniques and skills Players learn best by doing so give them the chance to practise, challenging them with new techniques that take them out of their comfort zone. Developing the Skilful Player... Players learn best through doing the aim should be to let them take as many touches on the ball as possible. We've got to think that, each touch they take, the better they are becoming. Our aim should be to increase the contact time with the ball, less standing around waiting for drills and more touches, manipulating the ball with all parts of the foot, at different speeds. Initially, the aim should be to challenge the player with new ball mastery skills, turns, and dribbling drills. Focus firstly on the use of the stronger foot, then progress to using their weaker side. Increasing their contact time on the ball, giving them progressions with their close control and technical training, will allow players to reach new levels of their game. In developing the skilful player, we must increase the amount of touches each player takes. Once we've begun to increase the contact time with the ball, we will soon see development in the player's technical ability. We want players to begin using this technical ability in match based scenarios. Can we develop and use 1v1s, 2v2s, 3v3s, creating pressurised environments that allow the player to demonstrate their skill? Even as adults, players like to have an end goal, maybe a chance to shoot, or target to pass the ball in to. Use fast, intense drills that allow players to demonstrate their skill and then finish with an end product. The more that we can place the young player in 1v1 or challenging scenarios, the better they will become. Allow the player to compete against others and focus on keeping the ball if under pressure. As a coach, we can't just tell players to be skilful, and players can't just decide that one day they will be skilful. Developing a skilful player is a process that takes time and plenty of guidance. In order to do that we need to build the right environment.. During training, players need to be encouraged to express themselves, praised for trying a new skill, even if they make a mistake. The more that players feel excited to try a new skill or technique, the more passion and confidence that they will have to perform skilfully. There are times where we see some players performing skill just for the sake of it, which, as coaches, can be incredibly frustrating. I know, I have been there myself. What is important is that we educate the young player on why not to do the skill for the sake of it, or just for show. Players can lose confidence in performing new skills or techniques if they see their Coach or Manager become frustrated in them. Build the player's confidence by praising and encouraging when they attempt to beat someone with skill. If it doesn't work, it doesn't work, we all make mistakes. But if we can remember that each mistake is one step closer to mastering the technique, then we will help players go a long way within the game. Each mistake is one step closer to mastering the technique. Plenty of technical practice, combined with an encouraging environment, is hugely important to developing the skilful player. When aiming to develop these skilful and technical players we should provide clear, concise, technical information, detailing the specifics of a skill or the technique. Players will learn through the detailed information, however, when they are playing in their games we can take a complete step back, letting the kids play without instruction as much as possible. Stepping back while the players are playing is vital to the developing player. With too much coaching, players can become reliant on their Coach's instruction, leaving their decision making lacking. Good players make their own decisions and learn from their own mistakes. If our centre back receives the ball, performs a step-over and gets tackled they will soon realise through that experience that there are certain areas of the pitch that they should preform the skill. Being the last line of defence isn't the best place to do this and they will realise that through their experience. In England we have some real talent coming through, players that are incredibly skilful who can beat any opponent put in front of them. Jadon Sancho, Callum Hudson-Odoi, Reiss Nelson, Phil Foden, plus many others all have tremendous ability on the ball. These players have something in common that is hugely relevant: they are all from South East London. In South East London there is a real environment for street football. Players will play in caged playgrounds, at the park, or in the road with their friends and others from the local area. These games can be very competitive and, in most cases, completely unsupervised. Due to this, these players practise and attempt new skills, without fear of frustrating their coach. There is a freedom in their game which is now showing in the performances of Sancho and Hudson-Odoi in England's latest Euro qualifiers. Wilfred Zaha is another who grew up playing street football, and we can definitely see that within his performances in the Premier League over the last few years. Street players allows players to thrive. Getting on the ball and just playing. Not all players are able to go out there and just play. We don't all live in a place where there are opportunities to play with others. However, players and coaches can work around this. All young players just love to play. How many times do we get asked, "When are we playing a game?". They love to play and we, as Coaches, should let them play as much as we can, within reason. To replicate the freedom that street football provides we could allow 15 minutes (or however long you have available) for the players to just play. Don't organise teams, or anything in fact, just give them a ball and let them play. No instructions, just the freedom to play and attempt new skills. In these situations the coach is there to make sure that all players are safe, other than that we can take a step back and watch these young players attempt new skills and improve their creativity. I know that I have been very surprised at the skills the youngsters can demonstrate in these games! We can always make space for a skilful player. Creating the environment and practising the technical side of the game will help develop a higher level of young footballer. Hopefully one day we can see one of our players competing at the highest of levels! Let Them Dribble Dribbling is a part of the game that, at the very top level, is becoming used less and less. Great teams, such as Pep Guardiola's Manchester City, favour a quick passing game, moving the opponents around the pitch before punishing them when they find the opportunity. In some cases, dribbling can actually bring pressure, making it harder for the team to keep possession, by attracting more defenders to the ball. But, we mustn't think that dribbling is a bad thing. It is actually a very important part of the game. Football has its own trends and fashions. It used to be that 4-4-2 was the most popular, with fast direct balls into the two strikers. Then 4-5-1s became popular, 3-5-2 and so on. With these different formations there have been changes in the way that the game has been played. At the moment, the old fashioned winger, such as Ryan Giggs, doesn't really exist, but what we mustn't do is focus and encourage youth players, especially up to the age of 12, to always pass. Instead, can we let them dribble? In youth development, we want the player to become as technically sound as possible, comfortable on the ball in all situations. If we are always encouraging the pass, or training players to pass instead of dribble, then we are drastically reducing the player's contact time on the ball. At young ages, the more touches, the better. We want players to get their head up and look for the pass, if their teammate is in a better position. But, we can too often tell players to pass when really we should let them dribble. At young ages we want to increase contact time with the ball. The up-turn in talented footballers in England at the moment is due to players being technically comfortable dribbling. The technical ability of young players is improving hugely. We can help that by allowing players to dribble more. Even defenders should practise their dribbling and 1v1 situations. If we can build the level of dribbling in the young players, we can significantly improve the level of footballer as they develop in the future. Dribbling can also help decision making; When does the player pass? Do they take that player on? Which foot do I keep the ball on? When do I dribble? There are many different things to think about, but players learn best through doing. They will make mistakes and dribble at the wrong times, but the more they do it at a young age, the better their decision making will be when they are older, allowing us to see players who dribble at the right times, and pass at the right times. Dribbling will come back in to fashion one day, let's not just coach to the current trends, instead coaching all areas of technical development. This month's Strength & Conditioning exercise is the power clean. The power clean is a hugely respected exercise, across many sports. If taught and used correctly Olympic lifts such as this can be a huge advantage to the athlete. Step 2 Let the bar move down to your thighs to just above knee height. To get under the bar you must shrug your shoulders and pull it up your body. Step 3 The final transition is to drop under the bar, finishing in the catch position that is shown in the picture below. We love watching skilful players. So how can we develop more of them?